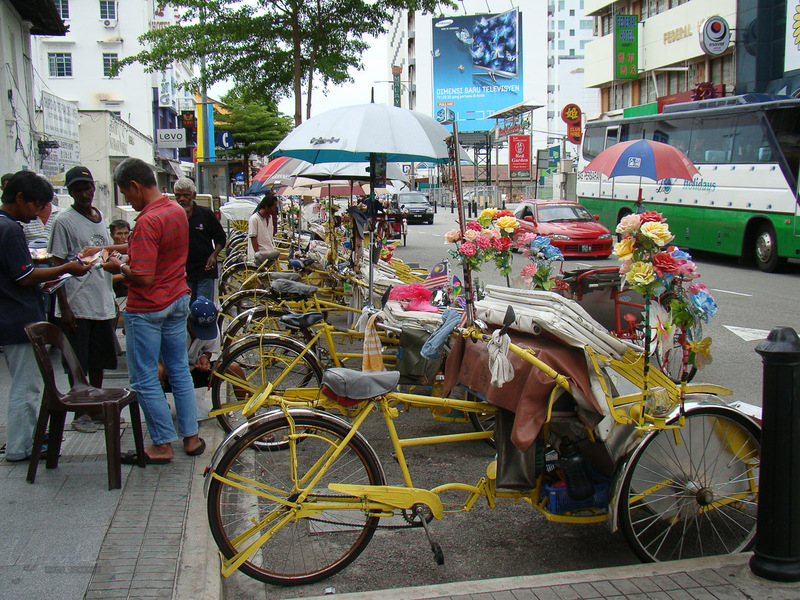 If you’re visiting Penang, public transport is definitely worth considering to get from place to place. There’s an extensive bus network and Sunday mornings are ‘car free’ in the area around Lebuh Pantai (Beach Street). There’s also a wide choice of cycle transport available. 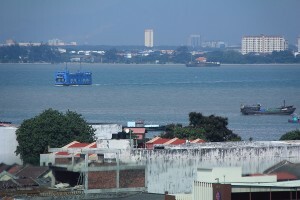 Penang is one of the thirteen states (and three Federal Territories) in Malaysia. 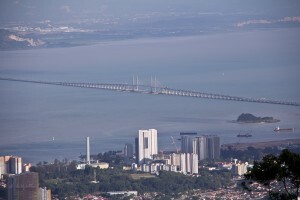 The state comprises the island of Penang and a strip running along the mainland side of the peninsular. If you are travelling to Penang by car you will most likely approach from either south or north along the North/South Highway which runs the length of the peninsular between Bukit Kayu Hitam in Perlis and Johor Bahru in the southern state of Johor. ** NOTE TO DRIVERS Be aware that Parking inspectors in George Town really do their job and you will get a hefty fine if you park in the wrong place. As parking in some areas is limited, it might be a good idea to leave the car at your hotel and walk or catch a bus. If you’ve got kids, they’ll have an adventure! If you come by train, you will get off at Butterworth and catch the ferry across. This is a vehicular ferry as well as for passengers. (Adults RM1.20, children 60sen.) 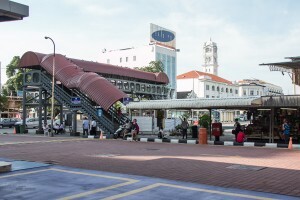 The RapidPenang Bus terminal is close to the exit on the island, turn to your left. The free shuttle buses (which do a circuit of the city area) leave from here as well. If you fly in, you’ll arrive at the Penang International Airport (bus information below). If you prefer to take a taxi to your hotel, purchase a coupon from the booth just to your right as you exit from the Arrival Hall. The taxi queue starts just in front of the booth and you will take the first taxi at the rank. **TIP The Snake Temple is an interesting temple, built in the mid 1800s and quite close to the airport, just off the main road into the city. 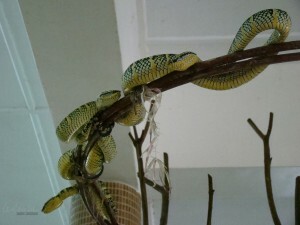 The snakes just turn up by themselves and have done so for many years. If you’ve got a friendly taxi driver and would like to see the snakes (green and yellow pit vipers) all over the altars and rafters in the temple, ask if he’d mind taking a detour for you to have a look. We’ve stopped off a few times, and generally the drivers are happy if you offer them a bit extra (RM10 should be OK) and don’t take more than about 15 minutes. 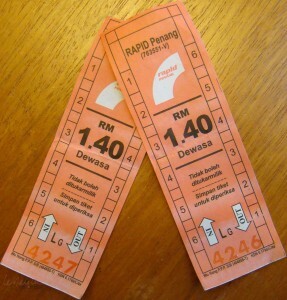 In Penang, public transport (the buses) is known as RapidPenang. The extensive network covers much of the island and mainland part of Penang – find the Route Map here Click on a Route number to see a map, the roads covered and in some graphics, the fare for a full journey. If you’re a tourist (international or domestic) visiting Penang for 7 days or more and plan to make good use of the buses, you may find it handy to purchase a Rapid Penang Passport – a seven day pass which will cost you RM30 and give you unlimited bus travel within that time. A number of buses service the Penang International Airport. Bus 306 runs from the hospital to the airport. 401E runs from the Ferry to Jln Tun Sardon, with a stop at the airport. 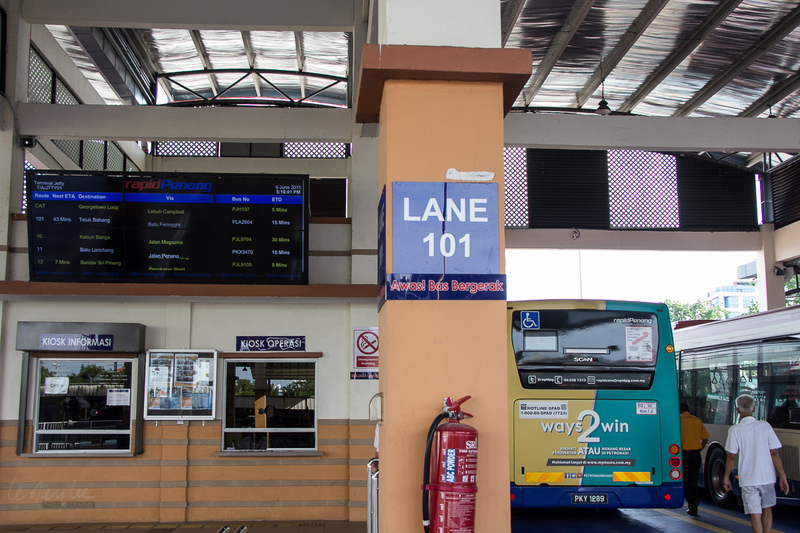 102 is useful if you are staying at the northern beaches because the route starts from Jalan Teluk Bahang and runs via Jln Burma and Komtar, to the airport where it terminates. Once you’ve identified the route you want, check the schedules and fares from the pull down list on the left of the display pane. There’s also a Journey Planner. Watch out for the Hop On Free bus, which does a circuit of the city centre – there are signs at the stops which indicate the routes. For more information on the Bus service and Routes for the Free Hop On Bus (CAT), you can download a brochure. Please note that the map on the page has been rotated to the right and the ‘U’ (Utara) is North. From 1st April 2018, there will be a Free Feeder bus service in operation. This will cover 12 areas on the Island and the Mainland, linking to the RapidPenang services. Walking around George Town has improved considerably over the years. 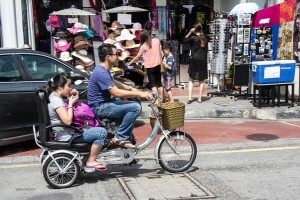 Most areas of the city have reasonable footpaths and one of the advantages of walking is that you can stop frequently to do what many people visit Penang for – eat! or at least have a cool drink. For a few food ideas, we’ve got THIS for breakfast, and a couple of Good Food in Penang that won’t wreck your budget – Part 1 and Part 2. 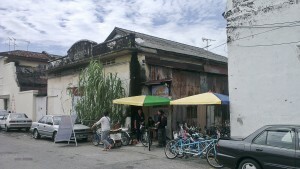 You’ll also discover many little unexpected surprises – the many clan temples or one of the rapidly disappearing shipping support businesses near the port – there’s an anchor maker just along Armenian Street Ghaut. Every Sunday morning a good part of the area around Lebuh Pantai (Beach Street) is closed to cars. 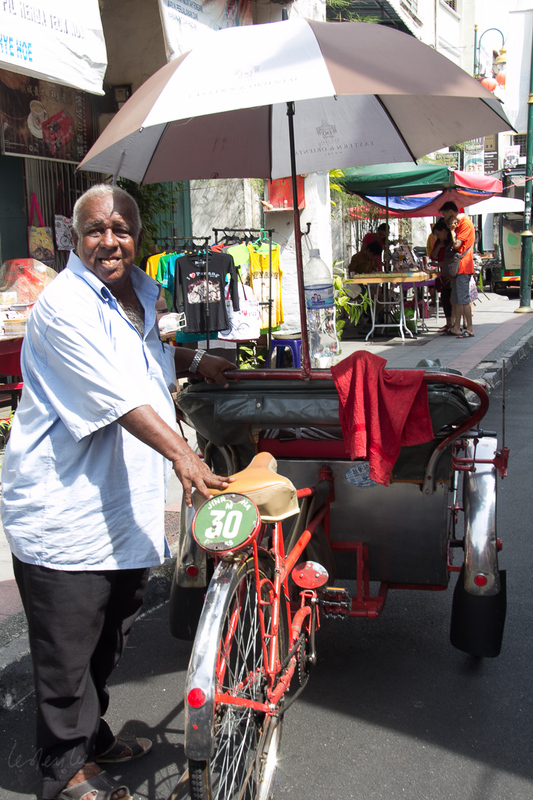 Many people rent or bring their own bicycles to get around, or they just enjoy the car free opportunity to wander. 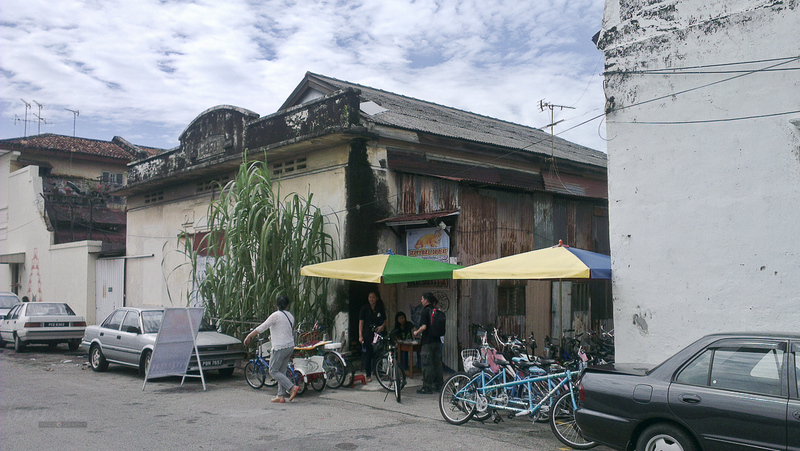 If you’d like to contribute to the Penang Heritage Trust, they do have guided walking tours but they are a little pricey for the budget traveller. 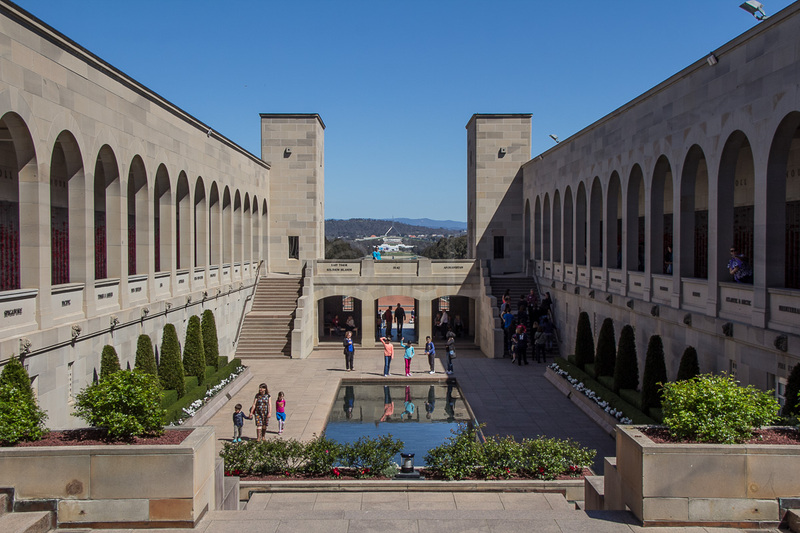 However, looking at their website will give you an idea of some of the places you can go. Watch this space, we’re working on a list of our own. 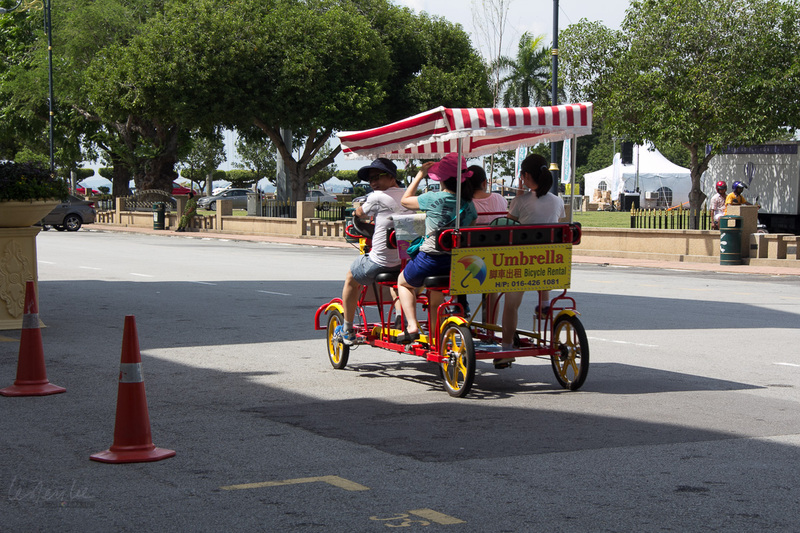 As you walk around George Town you may see trishaws passing by. This mode of transport used to be very common. Most of the trishaw riders are elderly and there are fewer trishaws on the roads now. 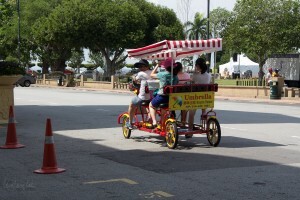 Penang trishaws have the cyclist behind with the passengers in front. This is different from other locations where the rider is at the side, much like a motorcycle with sidecar. 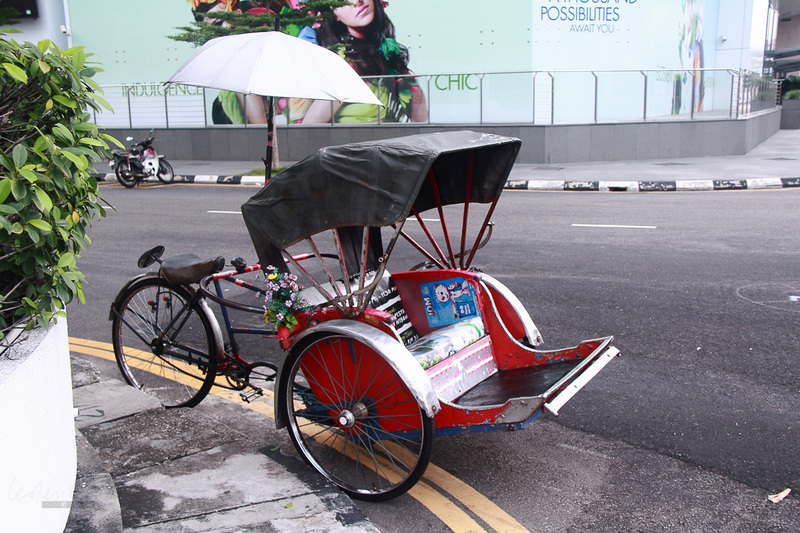 Agree on the price with the rider before you start, around RM30 per hour is a reasonable amount. Ask him first, if you have a particular destination in mind and he’ll quote you a price. Most importantly, remember it’s hard work for the rider and most are interesting chaps to talk to. Bicycle Rental starts at about RM10 and there are many rental points around the city. Some of these also offer helmets etc. There’s a variety of bikes available from singles to multiple rider cycles as well as some with baby carriers. The newest player in the self cycle choices is Linkbike. This uses the concept of pick up, ride and return to any of the other 25 other stations. That will be familiar to those who’ve used it in cities from Melbourne to Brisbane to Amsterdam. Download the App from their website.